The Moto G (2014) offers everything that we loved about the original, this time packing a larger display and an updated camera package, while keeping the same unbeatable price tag. If you’re in the market for a good, budget-friendly smartphone, the Moto G (2014) is one of the best mid-range smartphones you can buy. As good as the original Moto X was when it released last year, Motorola really shook up the smartphone market with its mid-range offering, the Moto G. Proving that a budget-friendly price point didn’t have to mean a compromise in quality and user experience, the original Moto G went on to become the company’s best selling smartphone. Motorola has now followed that up with a device that may be largely similar under the hood, but with a larger footprint and some new design elements. Here’s our comprehensive review of the Moto G (2014)! The design aesthetics of the new Moto G remain similar to its predecessor, at least from the back, featuring the same curve and the now signature dimpled Motorola logo. The build material is entirely plastic, and while the build quality is decent, there are some factors that remind you of the fact that this is in fact a sub-$200 smartphone. While these may just be the case with this particular review unit, I found the tactile feedback from the volume rocker and power button to be very disappointing, and the buttons also rattled when the phone was shaken. I also found the lines to be uneven where the screen meets the frame of the phone. It certainly feels like the build quality of the original Moto G was superior to this latest version. With the bump in the screen size, the new Moto G is also much bigger than its predecessor, but is still compact enough to allow for a comfortable handling experience. The curve on the back lets the phone sit snugly in the hand, and one-handed use is still quite easy. The back cover is also removable, not only allowing for access to the microSD card slot, but also to add your own stylish take by swapping the back cover with various other colourful options. It’s not the customization options you get with Moto Maker, but it’s still nice to have some customizable elements available. 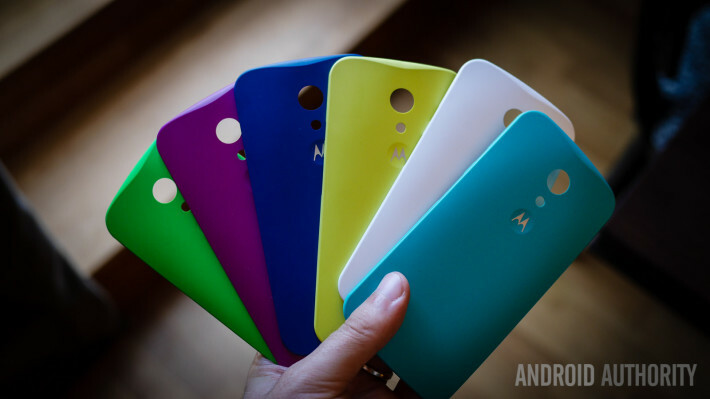 Related: Best Moto G (2014) cases & shells. Up front is the biggest change in terms of design and features, with the Moto G now sporting front-facing speakers. Unfortunately, the only good thing about these speakers are the direction in which they are facing, as they don’t get very loud, and the sound quality lacks some depth. The Moto G received an upgrade to the display, at least in terms of size, with the latest iteration featuring a 5-inch IPS LCD display, but retaining the 720p resolution from the original, resulting in a reduced pixel density of 294 ppi. It may not be the sharpest display around, but is still a very capable performer. Brightness isn’t an issue, colours look surprisingly good, and viewing angles are as you would expect from an IPS display. Overall, you get a really good display when you consider the price point of this device. One aspect that hasn’t seen an upgrade between iterations is the hardware. The processing package remains the same, with the new Moto G rocking a quad-core Qualcomm Snapdragon 400 processor, clocked at 1.2 GHz, backed by the Adreno 305 GPU and 1 GB of RAM. This is the current go-to processing package for mid-range smartphones, and as expected, the performance on the Moto G is smooth as well, helped in part due to its stock-like software experience. The Moto G handles tasks like swiping and scrolling, opening and closing applications, browsing the web, and even some graphically-intensive games without a hitch. That said, it doesn’t take much to slow this device down if you’re trying to do a lot of things at once. That’s just something to keep in mind if you decide to pick up this phone, but the overall performance is more than satisfactory. In other hardware, you get a slew of connectivity options, but unfortunately, 4G LTE isn’t available, which could be a turn off for some. The new Moto G is available is 8 GB and 16 GB flavours, with the option to expand the storage up to 32 GB. Powering the Moto G is a relatively small 2,070 mAh non-removable battery, and considering the size, the battery performance is just about average. Power users are going to have a difficult time getting a full day of use out of this device, but this mid-ranger isn’t meant for such users anyway. With moderate use, I was able to make it through a full day with around 4 hours of screen-on time, so most users shouldn’t have too many complaints with regards to the battery. The new Moto G received an upgrade in the camera department, boasting an 8 MP rear shooter with a LED flash. The camera software remains the same across all Motorola devices, and is clean and simplistic. Basic settings are available, including HDR, panorama, and video recording, but nothing much else that offers more extensive control. In good lighting, photos came out looking sharp, with minimal noise, and colour reproduction that was better than I expected. Contrast wasn’t great though, and exposure seemed very hit and miss at times, but when the exposure is just right, you can get an impressive shot. This isn’t a high-end camera sensor, and as expected, it struggles in situations where the lighting isn’t optimal. In low light, images are very noise, and it detail isn’t captures very well. All said and done, the camera performance was still a lot better than I anticipated. One of the best things about owning a Motorola device these days is that you essentially get a stock Android experience. In the case of the Moto G, you get Android 4.4 Kitkat out of the box, with it also being one of the first few devices that will receive an update to the upcoming Android L release. The software experience on the Moto G is even closer to stock than on the Moto X, as a lot of the additional Moto X features, such as Moto Voice and Moto Display, don’t make their way here. This does have to do with the limitations of the hardware, but would have still been great features to have on the Moto G. The launcher is similar to the Google Now Launcher, without a dedicated screen for Google Now, and as expected, the software experience contributes to the overall smooth performance of the device. One of the biggest selling points of the Moto G last year was its unbeatable price tag of $179, and that remains the same with the current iteration as well, which is a huge plus. It does lack LTE connectivity which is a bit of a let down, but its price point more than makes up for any shortcomings it may have. And so there you have it – a closer look at the Moto G (2014)! It’s obviously not the fastest or most powerful phone around, but what the Moto G offers is a great software experience, mid-range specifications that do extremely well, and a larger display that is more than capable, all for a price tag that is sometimes difficult to comprehend. If you’re in the market for a good smartphone on a budget, the Moto G (2014) should be at the top of your list.